A special thank you to Susan Weil and Judy Shea for steadfastly supplying me with Gertrude Stein books over the years and having the perseverance to start my collection all over again after it was stolen from over my head on a Greyhound bus in 1983. These. Have not a cousin. Gertrude Stein has been studied extensively as a poet, novelist, and playwright. She has had ardent followers and acrimonious detractors, and has spurred many lively debates. There has been, however, little or no examination of her non-fiction writing. With this modest analysis of a six page section of her book, How to Write, I hope to shed light on an under-acknowledged non-fiction author. I believe continued discussions of Gertrude Stein's non-fiction work will lead to recognition of her vital role in the history of creative non-fiction and that a familiarity with her techniques and innovations will generate increased possibilities for the future of this genre. I first encountered Gertrude Stein's writing as a teenager and quickly fell in love with its odd combination of sincerity and nonsense. Every New Year's Eve a gallery in New York City, where I lived, hosted a continuous and complete reading of Gertrude Stein's massive 1,000 page novel, The Making of Americans, based on her extended family. I made it a point to spend each New Year's Eve sitting on the floor of the Paula Cooper Gallery listening to Gertrude Stein's words being read by a wide assortment of readers: dramatic-voiced actors, meek-voiced Stein enthusiasts and everything in-between. I no longer make it to those readings1, now that they are three thousand miles away from where I live, but my experience of that steady, continuous drone of text now instructs me on a scholarly approach to her writing. Let me indulge in a recollection of those days and nights from the seventies and eighties. Under this literary wash I would settle on the floor next to a column and give nearly as much attention to getting comfortable as to listening. I went to these annual readings for at least a decade, sometimes only making it inside those heavy doors for an hour or two. One year I stayed all-night and listened drowsily to 300 of the 1,000 pages. Another year, at my allotted time, I joined one other designated reader at the folding table, and struggled not to stumble on the unpredictable words. The time I stayed up all night and the time I read, I felt privy to the hidden table of teas and cookies that was on the other side of a partition, back near Paula Cooper's office. My memories of all those different New Year's Eves are surprisingly uniform. Entering into that hushed white gallery was like entering a temple of Words, tended by Gertrude Stein, an easygoing, if opinionated, caretaker. The luscious sounds and meanings of words were honored but not scrutinized. My attention sauntered from getting my body comfortable, to the non-escapades of the book's heroine, Martha Hershland (usually describing such "action" as follows: "And yet always Martha had the important feeling, she knew what was the right way to do to keep on living, to help people to marrying, to make the world keep on as it was in the beginning" (73) ). Long strings of words twisted out in ever changing permutations and repetitions. The narrative was marching on for its continuous 56 hours and there was no stopping and going back to analyze the meaning of a phrase or a paragraph. The words rolled on past and sometimes I jumped on and understood them, and sometimes they rumbled pleasantly by. I had never experienced such a lackadaisical yet resonant relationship with words. Without ever hearing or reading the whole book, I was wedded to the words; somehow I found solace in the simple vocabulary and ambitious attempts to find and express the ineffable essence of each of the book's characters. As the story of the book's primary characters, the Hershlands and the Dehnings, developed in almost geologically slow time, I was wooed by Stein's expansive, detached descriptions of individuals: "She always had suspicion in her of every one around her, anxious feeling was always an excitement to her, she had a great deal of it in her" (196) . The pretense that decorates upper middle class life was filleted open with methodical and lyrical description. Each part of the book, each paragraph and sentence, stood on its own because the very language itself was as much (or more) the focus of the book, as the story. I could open the book anywhere, start reading and find contentment in the foreign landscape of Gertrude Stein's language. The words made an agreeable and coherent music that satisfied a non-analytical part of my brain. Later I would read a quote by Edmund Wilson that captured her writing's mysterious ability to resonate deeply in unknown ways. He described her writing as "registering the vibration of a psychological country like some human seismograph whose charts we haven't the training to read" (qtd. in Watson 48) . Did Gertrude Stein write to the unconscious? Did she write from the unconscious? In The Autobiography of Alice B. Toklas, she gives an answer: "[…] by refusal of the use of the subconscious Gertrude Stein achieves a symmetry which has a close analogy to the symmetry of the musical fugue of Bach" (50) . Gertrude Stein says she "refused" the subconscious. Was her writing some diabolically modern chant working its twentieth century magic on the listener? Yes, I think so. Was it random nonsense? I think not. Whenever I would pull open the heavy door to the Paula Cooper Gallery, and listen to whatever page was being read, I was struck by the intimacy of her words. Gertrude Stein, in The Making of Americans, was as earnest and irreverent as a teenager -- qualities that I have found in nearly all of her writing. In many ways I return to this early experience of Gertrude Stein for instruction. One basic lesson I learned was the importance of hearing her writing read out loud. Gertrude Stein treats individual words as vibrant beads, which she strings together in such a way that their sound and intrinsic individual meaning are given the primary emphasis. Another lesson was not to grip the words too tightly, looking for exact meaning. Stein's writing works its alchemy when the reader or listener lets go of analyzing and simply experiences: lets the words by-pass the left brain and go straight, deliciously, to the right. This is a please this is a please there are the saids to jelly. These are the wets these say the sets to leave a crown to Incy. Whether or not all of these coded associations were actually conscious choices of Gertrude Stein, the analysis seems to suggest that there is more content and context in her words than one might initially suspect. 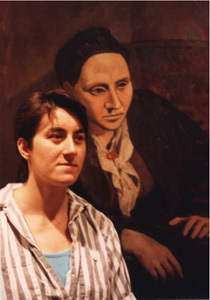 Lisa Ruddick wrote an extensive analysis of Gertrude Stein's book of poetry, Tender Buttons, and other texts Gertrude Stein completed around the year 1912 (the year before Susie Asado was written) in which she makes a case for Stein's themes on menstruation and the liberation of the female body and spirit. Lisa Ruddick combs through the abstract language of these early Stein texts and excavates a matrix of menstrual references and glimpses of a return to female culture. For example, in a line from Tender Buttons "A PETTICOAT: A light white, a disgrace, an ink spot, a rosy charm" (Writings 1903 - 1932 322) . Lisa Ruddick finds this extensive analysis: "…the third term standing between the two menstrual images of ‘a disgrace' and ‘a rosy charm' is ‘an ink spot.' The association is between the ink spots on Stein's page and the rosy spots on a petticoat. The ‘white light' that precedes all three terms then refers doubly to the blank page and to the petticoat just before either is marked" (Critical Essays 228) . I think that one can go too far in trying to extract meaning from Gertrude Stein's writing. Lisa Ruddick's extensive theories are plausible but I think they misjudge the intent with which Stein created her work. Perhaps the emergence of consistent female-centered images says more about Gertrude Stein herself and the writing process she developed than hidden meanings she was trying to convey. Gertrude Stein was uniquely impervious to societal expectations and mores. Her life was an oasis for the gay community; most of the people who came to her salons were gay or lesbian (Prepare for Saints 19 – 21) . The way she dressed and carried her large body in loose fitting clothes show an astonishing level of acceptance and comfort with herself, especially for the turn of the century! That her writing would be filled with female imagery, even menstrual imagery, is consistent with the way she lived her self-determined life. But is candor about the female body and feminist theory what she wanted her readers to find in her writing? In an interview with Robert Bartlet Hass in the last months of her life, Gertrude Stein said this about Tender Buttons: "I was not interested in what people would think when they read this poetry; I was entirely taken up with my problem and if it did not tell my story it would tell some story. They might have another conception which would be their affair. It is not necessarily attached to the original idea I had when I wrote it" (Primer 30) . Gertrude Stein was primarily interested in creating an intimate and exact relationship between her immediate experience and her words: "I was trying to get this present immediacy without trying to drag in anything else…. I have been trying in every possible way to get the sense of immediacy, and practically all the work I have done has been in that direction" (How Writing is Written 157-158) . The resulting work is in some ways like a mental snapshot. We, the readers, need not know the significance, to the photographer, of everything in the photo in order to glean its truth, warmth, and perfect idiosyncrasy. What, then, is the best way to approach the writing of Gertrude Stein, in general, and her non-fiction work specifically? By impressions or word-by-word analysis? Reading some of the extensive work that has been done to understand her fiction work, I can see that both have value. Together, impression and analysis, in balance, do the best justice to the work. In this paper I will use both the tools of impression and dissection to begin an exploration of her non-fiction writing. Understanding that Gertrude Stein saw her work as an intimate dance with her immediate present, I think that the reader's direct experience of the writing is one vital way to understand the work. I also want to examine the six pages of the A Grammarian section of How to Write with a fine-toothed literary comb to better identify and understand Gertrude Stein's techniques for non-fiction writing. In many ways Gertrude Stein was decades ahead of her time. She seized and defended her spot in history with the unabashed ambition of Martha Stuart. She wrote literary pieces with little or no care for their being understood. She became an early, vital, patron and proponent of Cezanne, Picasso, and modern art. At a time when Paris was filled with avant guard "Salons" where artists and intellectuals would gather, Gertrude Stein rarely went to any of them but instead carried on her own where movers and shakers of the art world would come to see her (Prepare for Saints 19). She shared openly the fact of her female "companion," Alice B. Toklas, who accompanied her everywhere including to the White House for tea (GS Writings 924) and to NBC studios in New York for an interview (GS Words & Pictures 163) . She banished her bra, and her corset, as early as 1905. Judging from Gertrude Stein's courage and foresight, I believe we can still look forward to the fruits of Gertrude Stein's literary innovations and her example of chutzpah. We still have yet to fully explore her written legacy. She created 571 works in her lifetime (GS in Pieces 385) , including novels, poems, plays, operas, children's books, mysteries, erotica, and non-fiction, and only a few of these have been thoroughly studied. Her approaches to each of the many genres she explored was radical and virtually without precedent (GS in Pieces 12) . Her work still challenges and engages scholars and readers. What are the repercussions of the work of Gertrude Stein? In an on-line journal called Tender Buttons I found an article entitled "The Mother of Postmodernism? Gertrude Stein on line." The author, Annette Rubery, says that "Indeed, cyberspace is in many ways the logical end to an extensive project which Stein – amongst others – began at the turn of the Century; a project in which a coherent sense of time, memory and history are rejected in favor of non-narrative modes of representation." What other revolutions do her innovations anticipate? And is her radical handiwork continuing to shape the emergence of literature in general and creative non-fiction in particular? Judith Malina, innovator in modern theatre, describes the affect of Gertrude Stein's words: "Everything in the modern theatre has been touched by Stein's reorganization of the English language. She freed the theater in every dimension. She simply plowed everything under and it allowed us a wide field to experiment with new forms. And the seeds she planted have continued to grow." (qtd. in Watson 304) . If her influence was so dramatic for the theater, did that same powerful plow reach the field of creative non-fiction? What seeds might she have planted there? And do they continue to grow? Perhaps A Grammarian holds some clues. As we embark, let me offer a rationale for using How to Write as an example of Gertrude Stein's creative non-fiction. Not only for pleasure for pleasure in it that I do it. It was painfully ironic to Gertrude Stein that her very uncharacteristic The Autobiography of Alice B. Toklas was her ticket to fame. It instantly became a best seller. Although The Autobiography of Alice B. Toklas, and Gertrude Stein's other comprehensible non-fiction may have an important place in the canons of creative non-fiction writing, I prefer, in this paper, to tackle the more challenging and innovative branch of her non-fiction writing. I believe that she would approve of the choice. How to Write is from the more abstract, creative, branch of Gertrude Stein's non-fiction. It was written from 1927 – 1931 (Bridgman 376-9) , when her writing career was in full blossom. Over these same years Gertrude Stein wrote many of her best known pieces: Patriarchal Poetry, Four Saints in Three Acts, Lucy Church Amiably, and Before the Flowers of Friendship Faded Friendship Faded (Bridgman 376-9) . Gertrude Stein considered How to Write a prose book; in her later book, Lectures in America she says this about How to Write: "In spite of my intending to write about grammar and poetry I am still writing about grammar and prose […]" (227) . Gertrude Stein uses How to Write as a vehicle to explain and demonstrate her philosophies about writing, language and grammar. The A Grammarian chapter, which was written in 1930, has a strong first person voice ("I am a grammarian" (105)) and you can almost hear Gertrude Stein playfully demonstrating her radical, notions about grammar and writing. At first reading, the writing seems to have spent some time in a blender. Phrases are strung together in illogical ways that almost flow smoothly but just don't make any sense: "Now how could one which is different from what how did one forget" (105) . It is like a collage that a child might paste together from different pictures of people from magazines; the lines might be continuous but the figure in the end has three legs, a giant head and a foot for a hand. If I take a lesson from my early experience of hearing The Making of Americans, and don't work too hard to distill meaning out of the chimera, I begin to get a flavor of what this chapter seems to be about and an appreciation of the humor she is using to express it. I may not, however, understand exactly what any of it means. Just when I become baffled and stumped by a string of cryptic sentences, along comes a semi-comprehensible jewel: "The essence of grammar is that it is freed of following" (106) or "Bother is a word that transgresses meaning" (108) . After several readings of the chapter a very rough contradictory picture starts to emerge. Gertrude Stein appears to take great pleasure in grammar: "Grammar. Fills me with delight" (106) . And yet she seems downright annoyed by its limitations: "Forget grammar and think about potatoes" (109) . A Grammarian emerges as a love/hate song to grammar and the established conventions of writing. As a visual artist myself, who draws from models, I understand the dangers of drawing from memory rather than from what you see in front of you. It took me years to stop drawing from my "remembering" when I drew model's faces. I have always been good at drawing what I actually see when it comes to drawing the body of a model. But when it come to drawing their faces, my preconceived ideas about what a face should look like leak out and ruin the drawing. For about 15 years I solved this by drawing figures that were bigger than the page; there was simply no room for the faces. Then I finally decided to tackle my weakness and I began drawing faces exclusively. When I would give up my mental image of what I expected the faces to look like, and really see what was there from the angle I was looking, I saw some pretty unexpected sights. If I was looking from below, all I might be able to see was a chin and two big nostrils sticking out above them. From the side I might only be able to see a check bone and eyelashes. Looking down on a face, the nose might cross the line of the mouth. If I had the courage to draw these strange anatomies as I saw them, I was usually surprised by how realistic it would end up looking on the paper. The way thousands count out loud they do it with moving their lips. Made a mountain out of. Now this is perfectly a description of an emplacement. If you think of grammar as a part. Can one reduce grammar to one. One two three all out but she. (109-10) The snapshot of her immediate thought process contains all the little phrases and observations that might be sparking away in the convolutions of her brain at any one moment. If I approach A Grammarian with an understanding that Gertrude Stein was trying to capture "the realism of the composition" of her thoughts about writing, it helps me accept her patchwork of images and assertions. It is an extra bonus to know that much of the writing of this period was done while sitting in her two-seater runabout Ford, named Godiva, waiting for Alice B. Toklas to return from an errand at a store. Steve Watson imagined her "in Godiva's high front seat," writing Four Saints in Three Acts, "letting the street sounds mix with the verbal rhythms in her head." It turns out that at least one of the compositions that she wrote in this period actually has oblique references to her Ford (Words and Pictures xiv) . A Grammarian almost has the feeling of street-chatter to it; what may have been background noise moves into a cluttered, egalitarian foreground. There are reference to things she may have seen from her ford: a steamer (105) , an empty lot (107) , a darling dog (109) , thousands counting out loud (110) , and the last line of the piece: "Grammar in relation to a tree and two horses" (111) . There are some lines that might be fragments of overheard gossip: "The Mabel Earls which is really the name of one of the daughters were not rich she was not rich nor were her sister or had her father as they were poor. There is no use in trying to change that" (107) . The piece has the feel of an urban cacophony; each noise and thought has an equal value with every other noise and thought. It is an extreme example of non-hierarchical writing. Where is Gertrude Stein's persona and voice in all this racket? It is actually quite prominent. Consider the first line of "A Grammarian:" "I am a grammarian." (105) . The word "I" appears no less than 48 times in a piece that is only 1727 words long ("I" constitutes almost 3% of the total number of words). Although she is making statements about herself, we come away with little new information about her, other than that she is a grammarian (the line: "I am a grammarian" appears seven times in A Grammarian). This pattern of oblique self-disclosure is trademark Gertrude Stein. Richard Bridgman finds the beginnings of this life-long approach in her very early books, Three Lives (written 1905-6), and The Making of Americans (written 1906-11). In the following quote he refers to a novella from Three Lives. Richard Bridgman also notes that through abstraction she was able to raise her personal problems to the level of universal struggle: "Stated at a sufficiently high level of abstraction, individual problems appear to become universal dicta […] (57) . It became a way of de-marginalizing her personal experience – an endeavor that would be embraced by feminists decades later. The oblique reference appears throughout "A Grammarian." The second line of the piece is "We will or we will not cry together" (105) . This line seems to simultaneously offer up a chance to be aligned with Gertrude Stein and then to doubt our qualifications. We are not sure exactly what will qualify us as being able to "cry together" with her, but we hope we are good enough to be in league with her. Over and over in the piece, Gertrude Stein is tempting us with tidbits of information that are just out of reach: "Having given too little and then added too much" (107) , "I say the sense interests me" (108) , and then, acknowledging her tantalizing prose, "Anybody can see nearly what I mean" [emphasis mine] (110) . To approach this elusive persona, I return back to my days at the Paula Cooper Gallery, remembering how much I got out of the writing if I didn't grab onto it too tightly looking for explicit meaning. Even though the "cup" of her literary self-portrayal is half-empty, it is still half-full with morsels from her daily life and odd snapshots of her outlook. When Gertrude Stein and Alice B. Toklas began their life-long partnership, Gertrude Stein's mastery of the indefinite reference flourished. Early in their romance, Alice B. Toklas began helping Gertrude Stein proof Three Lives (Bridgman 110) . She then taught herself to type in order to transcribe The Making of Americans while Gertrude Stein was writing it. Gertrude Stein would stay up late at night writing in small French school notebooks. When she went to sleep she would leave the notebooks for Alice B. Toklas who would get up early in the morning and type the new text. The text became a coded communication link between the two lovers. Claudia Roth Pierpont writes: "With someone now listening to her so well, Gertrude began to pour out words without hesitation, revision, or second thoughts. […] there were the sweet-breathed burps and coos of utter infantile contentment […]'" (84) . Gertrude Stein actually developed a code language for her sexual life with Alice B. Toklas that is provocative even if we can't read the code: "Did she say jelly./ Jelly my jelly./ Lifting belly is so round./ Big Caesars./ Two Caesars./ Little seize her./ Too./ Did I do my duty […] (Writings 429) . It is surprising that even in the non-fiction text, A Grammarian there is a not so coded message for Alice B. Toklas: "I love my love with a b because she is precious. I love her with a c because she is all mine" (105) . This appears within the first 10 lines of the piece and one can imagine Alice B. Toklas finding this manuscript early the next morning after it was written and smiling as she typed it up. […] That is a complexion and how do I do it. I wish I knew how I did it. I wish I knew how I did it. (108) Dialogues with her conscience, whispers to her lover, games with the sounds and meanings of words, and admonishments; if we listen carefully we can hear all these voices at play in "A Grammarian." These were all part of her immediate experience of thinking about grammar, and about herself as a practitioner of grammar. For many people when they think about Gertrude Stein they think of "A rose is a rose is a rose. "3 Repetition is often the only thing people associate with Gertrude Stein's writing. I was interested, when I began work on A Grammarian to see how this non-fiction work held up to the repetition stereotype; just how much repetition was there actually in this piece of non-fiction? The answer is a great deal. The word "grammar" appears 46 times in the 1727 word piece.4 In the first 29 lines of text, I found 126 repeated words. I define "repeated words" as words that have the same, or a very similar, word appear in the same sentence, a contiguous sentence or one sentence over. For example in the following three sentences I found 13 repeated words which I have underlined and highlighted to show their matched word. The yellow highlighted words match words in the two sentences preceding, or following, these four lines. The thing that makes grammar is that they know but without doubt they come to be around. In the first 29 lines of text there are 215 words of which 126 are "repeated words" by my definition. That means 59% of the words are repeated, or echoed, in text very near by (See Appendix B for a color chart of these repeated words). This gives the piece an extraordinarily rich internal resonance. Sometimes when I am reading Gertrude Stein's work and I hear her lines repeated over and over again with some slight variation, I imagine the work as a flip-book: one of those little books of pictures that change slightly from one picture to the next. If you flip through the pictures -- or in the case of Gertrude Stein the words -- you see an apparently moving figure. I am a grammarian. I believe in duplicates. Duplicated means having it be twice. It is duplicated. There are beside duplicates. I am a grammarian and I do think well. Of it. Think of duplicates. They duplicate or duplicated this. This is very simple grammar. Who takes it there. This is not simple because it is not trained (105). Its all wrong they sit which is alright (105) . The door was open as well as closed (106) . The part that grammar plays. Grammar does not play a part (108) . I say the sense interests me. The sense interests me. That is not what I say. The sense interests me (108) . Over and over in A Grammarian, Gertrude Stein struggles with accepted literary forms such as grammar and with the limitations of making a one sided statement. Her immediate present was a rich weaving of contradiction, association and distraction, and her snapshot writing reflects that. Gertrude Stein was a connoisseur of words and yet she consistently chose a limited vocabulary. Richard Bridgman writes: "In addition to schematizing her sentences in search of precision, Gertrude Stein reduced her vocabulary. She remarked in The Making of Americans that she preferred to use a restricted vocabulary, for that permitted her to explore the nuances of a few words fully" (74) . A Grammarian has a typically limited vocabulary, and the character of each word in that vocabulary is prominent. Readers of Gertrude Stein may be drawn to certain words and become quite attached to them, or on the other hand, quite sick of them. A Grammarian has endeared me to three words in particular and I find them entered into my internal vocabulary with which I articulate my inner thoughts. They are: bother ("Bother is a word that transgresses meaning" (108) ), parlor ("A parlor is where the sisters receive their parents and their parents friends" (107) ) and agreeable ("A grammarian there is a pleasure in the air which is agreeable. Is agreeable to me" (106) ). Its all wrong they sit which is alright (105). Struggle and straggle make it a reunion (107) . Now in forty fortification (107) . You can duplicate a duplicate [they sound different even though they are spelled the same] (110) . Now the trouble with this is there is a conflict and not in thought but in reality. I am having it. Is that a possible tense (106) . Having made too little before now which it was you have given too much. That is a tense, to struggle (107) . Now think carefully. How rare they are. She moved very silently making a noise that is one thing to think about. Cliquet Pleyel. Makes twenty five a woman. That is a complexion and how do I do it Now be very gracious (108) . There. Makes twenty five be a woman. The meaning of that does not interest me. It is a complexion that interests that makes ridiculous because that does not make it sound something else. But it does make them which is again me. Makes twenty-five be a woman. I do not lose it. The color is there. Do you see. Dependent entirely upon how one word follows another (108-9) . A sentence would be the same as a peal. A peal is something that being chewed is to be wetted or rather perhaps before (108) . I am a grammarian in place. Perhaps the grammarian is acknowledging having given too little help and then added too much new work. Following "Thank you" there is the only space break between paragraphs in the entire piece. The gratitude is emphasized. What does A Grammarian say about grammar and how does Gertrude Stein use it in her text? The grammarian breaks rules of grammar left and right throughout the piece 5. Sentence fragments are prevalent. Punctuation is sparse or missing. Pronouns have unclear or absent antecedents. Even hyphens and apostrophes are missing. Her omissions however, are not consistent. Ambivalence is a good word to describe Gertrude Stein's approach to grammar. And intermittence it is in "A Grammarian." Sometimes she uses commas sometimes she doesn't: "As well, as much as a piece, so forth" (106) . "A peal is something that being chewed is to be wetted or rather perhaps before" (108) . Sometimes she uses a hyphen, sometimes she doesn't: "Makes twenty five be a woman. […] Makes twenty-five be a woman" (108) . Sometimes she uses an apostrophe sometimes she doesn't: "Its all wrong they sit which is alright" (105) . "No it isn't" (106) . Her intermittent use of grammar is fitting considering her ambivalence and fear about being coerced by its accepted forms. Using it as she wished put her back in charge. Gertrude Stein was exceptionally opinionated when it came to parts of speech and punctuation. She judged each category ruthlessly. This was another way she maintained her authority in the realm of language. What follows are Gertrude Stein's opinions on parts of speech, excerpted from Lectures in America, which she wrote in 1934, four years after she wrote "A Grammarian." After each excerpt a brief examination of her use of that part of speech in A Grammarian will follow. "As I say a noun is a name of a thing, and therefore slowly if you feel what is inside that thing you do not call it by the name by which it is known. Everybody knows that by the way they do when they are in love and a writer should always have that intensity of emotion about whatever is the object about which he writes. And therefore and I say it again more and more one does not use nouns" (210) . Despite her disdain for nouns, there does not appear to be a paucity of nouns in "A Grammarian." As I have said earlier, the word "grammar" appears 46 times in the text. Nouns play a significant part in the text of "A Grammarian." "Adjectives are not really truly interesting. In a way anybody can know always has known that, because after all adjectives effect nouns and as nouns are not really interesting the thing that effects a not too interesting thing is of necessity not interesting. In a way as I say anybody knows that because of course the first thing that anybody takes out of anybody's writing are the adjectives" (211) Adjectives are quite rare in A Grammarian but they are present. "Verbs and adverbs are more interesting. In the first place they have one very nice quality and that is that they can be so mistaken. It is wonderful the number of mistakes a verb can make and that is equally true of its adverb. […] Beside being able to be mistaken and to make mistakes verbs can change to look like themselves or to look like something else, they are, so to speak on the move and adverbs move with them and each of them find themselves not at all annoying but very often very much mistaken. That is the reason any one can like what verbs do" (211-2) . I find nothing exceptional about the use of verbs and adverbs in "A Grammarian." "Articles are interesting just as nouns and adjectives are not. And why are they interesting just as nouns and adjectives are not. They are interesting because they do what a noun might do if a noun was not so unfortunately so completely unfortunately the name of something. Articles please, a and an and the please as the name that follows cannot please" (212) . I find it interesting that Gertrude Stein is so enamored with these simple, almost meaningless, words. It makes it clear to me how purely she liked language for language's sake, unencumbered with particular meaning. Articles are not present in unusual numbers in "A Grammarian," but one is present in the lead sentence: "I am a grammarian" (105) that appears six other times in the text. "We will or we will not cry together" (105) . Usage of conjunctions in the rest of the piece is unexceptional. "Pronouns are not as bad as nouns because in the first place practically they cannot have adjectives go with them. That already makes them better than nouns. These have a cousin she is a nun. Their cousin these have several one of them is a nun. I love my love with a b because she is precious. I love her with a c because she is all mine (105) . If Gertrude Stein had strong feelings about parts of speech, she could get even more excited about punctuation. She was quoted as saying "Punctuation is necessary only for the feeble-minded." by the San Franciscan newspaper, The Chronicle, in April of 1935, in the middle of her American tour (qtd. in Stendhal 186) . In the interview conducted shortly before her death, she stated, "At this time [while writing Three Lives] I threw away punctuation. My objection to it was that it threw away this balance that I was trying to get, this evenness [equality?] of everybody [each word?] having a vote, and that is the reason I am impatient with punctuation" (Primer 17) . A Grammarian reflects Gertrude Stein's contentions with punctuation. Just about the only punctuation she does not seem to be fighting in A Grammarian is the period. Virtually everything else is used sporadically or not at all. Again, what follows are Gertrude Stein's opinions on punctuation excerpted from Lectures in America. After each excerpt a brief examination of her use of that punctuation device in A Grammarian will follow. "Of these ["punctuations"] the one but the first and the most the completely most uninteresting is the question mark. The question mark is alright when it is all alone when it is used as a brand on cattle or when it could be used in decoration but connected with writing it is completely entirely completely uninteresting. It is evident that if you ask a question you ask a question but anybody who can read at all knows when a question is a question as it is written in writing" (214 -5) . Not surprisingly, there are no question marks in "A Grammarian," despite the fact that there are clearly many questions. For example, the sentence "How is grammar different from other things" (109) has no question mark. "Exclamation marks have the same difficulty and also quotation marks, they are unnecessary, they are ugly, they spoil the line of the writing or the printing and anyway what is the use, if you do not know that a question is a question what is the use of its being a question. The same thing is true of an exclamation. And the same thing is true of a quotation" (215) . Again there are no exclamation marks or quotation marks in "A Grammarian." In the one clear case of a quotation in "A Grammarian," Gertrude Stein indicates the beginning of the quote with a capital letter: "It is not a triumph to say Having made too little before now which it was you have given too much" (107) . "One other little punctuation mark one can have feelings about and that is the apostrophe for possession. Well feel as you like about that, I can see and I do see that for many that for some the possessive case apostrophe has a gentle tender insinuation that makes it very difficult to definitely decide to do without it. One does do without it, I do, I mostly always do, but I cannot deny that from time to time I feel myself having regrets and from time to time I put it in to make the possessive case. I absolutely do not like it all alone when it is outside the word when the word is a plural, no then positively and definitely no […]" (216) . There is only one sentence in A Grammarian that would call for a possessive apostrophe and it is plural. It is left without an apostrophe: "A parlor is where the sisters receive their parents and their parents friends" (107) . (Note the use of commas in this quotation) "As I say commas are servile and they have no life of their own, and their use is not a use, it is a way of replacing one's own interest and I do decidedly like to like my own interest my own interest in what I am doing. A comma by helping you along holding your coat for you and putting on your shoes keeps you from living your life as actively as you should lead it and to me for many years and I still do feel that way about it only now I do not pay as much attention to them, the use of them was positively degrading […] And so I almost never used a comma. The longer, the more complicated the sentence the greater the number of the same kinds of words I had following one after another, the more the very many more I had of them the more I felt passionate need of their taking care of themselves by themselves and not helping them, and thereby enfeebling them by putting in a comma" (219-21) . There are many more commas in the preceding quote on the degradation of comma use than in "A Grammarian." There are six commas in A Grammarian and many more sentences that would typically call for the use of a comma. "What had periods to do with it. Inevitably no matter how completely I had to have writing go on, physically one had to again and again stop some time and if one had to again and again stop some time then periods had to exist. Beside I had always liked the look of periods and I liked what they did" (217) Periods are used liberally in "A Grammarian." "There are two different ways of thinking about colons and semi-colons you can think of them as commas and as such they are purely servile or you can think of them as periods and then using them can make you feel adventurous. I can see that one might feel about them as periods but I myself never have, I began unfortunately to feel them as a comma and commas are servile they have no life of their own they are dependent upon use and convenience and they are put there just for practical purposes. Semi-colons and colons had for me from the first completely this character the character that a comma has and not the character that a period has and therefore and definitely I have never used them" (218-9) . Sure enough, there are no colons or semi-colons in "A Grammarian." It makes sense, knowing Gertrude Stein's contentions with grammar, that her writing about grammar, and about herself as a grammarian, would have fitfully irregular grammar itself. What is interesting is how readable the text actually is without "servile" punctuation or "uninteresting" adjectives. Looking over Gertrude Stein's commentary on Grammar and what she actually used in her writing, we can approximate a recipe for Steinien Grammar: a minimum of adjectives, lots of pronouns, no interjections, no colons or semicolons, no exclamation marks or question marks, and only a smidgen of commas. Virgil Thompson, who wrote an opera with Gertrude Stein, said "The two things you never asked Gertrude, ever, were about her being a lesbian and what her writing meant" (qtd. in Watson 47) . To over-exert oneself looking for meaning in Gertrude Stein's writing is partially to miss the point of her writing. The writing is intentionally a dance with obscurity, or in Virgil Thompson's words: "quite an impressive obscurity" (qtd. in Watson 47) . Henry McBride, a long time admirer of Gertrude Stein's work, once wrote her to tell her how tiresome it was getting having to explain her work to others. He said, "I loathe explaining any work of art, and always insist that any work of art that can be explained is worthless […]" (qtd. in Watson 287) . With all that said, and with the understanding that we will never be able to completely "explain" the work of Gertrude Stein, I will venture a modest exploration into the meaning of "A Grammarian." "Grammar is not against sailing" (105) . "In grammar there is no change in choice" (109) . "Think closely of how grammar is a folder" (110) . "To look back in the direction in which they came./A grammarian is so./ Afraid." (110) . "The essence of grammar is that it is freed of following./ It was blown away by the wind" (106) . Over and over, Gertrude Stein's contradictory ambivalence emerges: "The subject is grammar./ Opposite to it./ The door was open as well as closed" (106) , and "The part that grammar plays. Grammar does not play a part" (108) . I find that I must keep cautioning myself not to hold onto the possible specific meaning in Gertrude Stein's work. In the medium of her immediate present they could have many simultaneous meanings and associations. Renate Stendhal said it clearly: "One and the same sentence can be abstract on one level, realistic on another and a double entendre on a third. With her own interpretation the author [Gertrude Stein] has pointed toward a possible explication de texte, in the sense of a personal, creative relation to language in which meaning and interpretation are necessarily private and consistently in flux" (xiv) . During these two decades she had broken away from many literary conventions. Narrative was the first to go. The language of logic was another. Discursive writing was a third. Traditional punctuation a fourth. Meaning, in the Aristotelian sense, a fifth. Traditional literary forms a sixth. There were others. Gertrude Stein's genius is not only in her many literary innovations, but also her ability to use and interweave them simultaneously. A Grammarian as a portrait of the immediate present alone, would have made an interesting piece. It would have been enough to experiment with a composition in which each part is as important as the whole. It would have been enough to turn the rules of grammar inside out, or play with words in new ways, or build a web of internal repetition that uses the majority of the words in the piece. The marvelous thing about A Grammarian is that all these things are happening simultaneously. First, she undoes the symbolic order by using words noninstrumentally; even where we can identify discursive content, there is an element of verbal play that distracts us. Like the infant in G..M.P., we experience words as sources of pleasure rather than only as ways of referring to other things. To force us to appreciate the texture of words, Stein uses puns, like "excreate," repetitive or rhythmic sounds, syntactic distortions, and paradoxically, a sheer overflow of reference that makes the text obscure rather than transparent. […] Second, Stein restores the perceptual indiscriminacy of the pre-Oedipal phase. She subverts selective attention by piling up objects and actions that demand dispersed attention. When we read "PEELED PENCIL CHOKE: rub her coke," or "Black ink best wheel bale brown," we cannot emphasize certain words and slight others without knowing we are missing something. Everything strikes us as important, so we attend to all impressions equally. […] (Critical Essays 236) . The challenge is to let ourselves give into the innocent receptivity that Gertrude Stein's creative non-fiction, as well as fiction, demands. By plowing expectation under, we will find a wide field to experiment in, and the rewards will be a flowering of new literary forms. Bridgman, Richard. Gertrude Stein in Pieces. New York: Oxford University Press, 1970. Stein, Gertrude. The Autobiography of Alice B. Toklas. New York: Vintage Books, 1960. Stein, Gertrude. Everybody's Autobiography. New York: Vintage Books, 1973. Stein, Gertrude. How to Write. Craftsbury Common, Vermont: Sherry Urie, 1977. Stein, Gertrude. How Writing is Written: Volume II of the Previously Uncollected Writings of Gertrude Stein. Ed. Robert Bartlett Haas. Los Angeles: Black Sparrow Press, 1974. Stein, Gertrude. Lectures in America. New York: Random House, 1935. Stein, Gertrude. A Primer for the Gradual Understanding of Gertrude Stein. E. Robert Barlett Haas. Los Angeles: Black Sparrow Press, 1971. Tender Buttons. Ed. Sonja Steuber. April 1998. Dept. of English, University of California. Jan. 1999 www.tenderbuttons.com. I love my love with a b because she is precious. I love her with a c because she is all mine. This is very simple grammar. Who takes it there. This is not simple because it is not trained. Grammar. If we cry, he cries he does not help himself as one without them. Grammar is not against sailing. If they have not boarded a steamer. He never thinks anxiously one at a time. What is grammar. A grammar is forgotten that there is a dog. Now how could one which is different from what how did one forget. Forgot forgot means forgetting or did not know there was one. How do you say Forgotten forget did know which he did not know as there was not formerly there is one. Its all wrong they sit which is alright. Which is alright with them what is the difference with them. Without them. Partly is the same as party. Partly is the same as a mistake. A grammarian there is a pleasure in the air which is agreeable. Is agreeable to me. They remain so that they are by themselves and for them agreeable to me. I am amazed that they spell with them. Think how angry he is. They are happy in not wishing to finish which they have begun to miss. It is useless to know how to say so. That is simple I made it do. Then I was hoping not to hear. If I made it do. They have to do it. Marguerite has to do it. The door was open as well as closed. Grammar. Fills me with delight. I am having it as a habit. Now the trouble with this is there is a conflict and not in thought, but in reality. I am having it. Is that a possible tense. No it is not. No it isn’t. I am having it as a habit. As a habit has no meaning. I am having it as a habit. Is completely false in reflection. The use of the word so. As well, as much as a piece, so forth. There any one can feel easy. Any one can feel easy. Is not perfect. They can feel easy, is alright. Any one can feel that it is easy. The essence of grammar is that it is freed of following. It was blown away by the wind. The wind has blown it away. The difference there is not interesting. If the wind blows you can see it. Having made too little before now which it was you have given too much. That is a tense, to struggle. Struggle and straggle make it a reunion. Gave it a measure. They give it twice there are two afternoons. Twenty days to two afternoons. Why is it a triumph to say twenty days to two afternoons. It is not a triumph to say Having made too little before now which it was you have given too much. It is impossible to have a triumph little by little and too much. There that is a commonplace in a mistake. Having given too little and then added too much. They were able to pay for it. Which it is very nice for them to do. Now try to change that to which it is very nice for them to be able to do now just try. They were not rich as they were poor. The Mabel Earls which is really the name of one of the daughters were not rich she was not rich nor were her sister or had her father as they were poor. There is no use in trying to change that. A parlor is where the sisters receive their parents and their parents friends. It makes me smile to be a grammarian and I am. They have to have friends. It is a wonderful way the way in which they have to have friends. Now thinking as a grammarian they are thinking. She is going to stay. That is one way of making it ammunition. Do not bother with me. Bother is a word that transgresses meaning. She and he are very welcome. The part that grammar plays. Grammar does not play a part. If a sentence is choosing. They make it in little pieces. Two know. Leave me alone a little. To know. That they are well off. A sentence would be the same as a peal. A peal is something that being chewed is to be wetted or rather perhaps before. Now think carefully. How rare they are. She moved very silently making a noise that is one thing to think about. Cliquet Pleyel. Makes twenty five a woman. That is a complexion and how do I do it? Makes twenty five be a woman. I say the sense interests me. The sense interests me. That is not what I say. The sense interests me. That is not what I say. The sense interests me. Grammar little by little is not a thing. Which may gain. Makes twenty-five be a woman. I do not lose it. The color is there. Do you see. Dependent entirely upon how one word follows another. Who knows how Howard likes hearing. I can do it so easily it always makes grammar but is it grammar. Forget grammar and think about potatoes. Grammar after all has to do with why they were presented. I see they observe they will feel well. Now this can be considered as a sentence or as synonyms. A darling dog. Is that a feeling or an expression. Essentially grammar has no use for distinctions had no use for distinctions now had it. To grammar it is the same thing whether they are urgent or whether they are useful. Do you see Grammar leaves repetition to their nouns. Now think. If you see me I prefer to see you. Now in the place of repealing they make use of sentences. It is very little to be able to count. On the edge of grammar is why they make things. Now again. It is easy to say he is obedient now. There is no change of choice. In grammar there is no change in choice. How is grammar different from other things. The last time that I went I came here. Now grammatically. There is this which is the way to admit of painting. Grammar does not mean that they are to limit themselves as if there were to be welcomed with it. Grammar does not make one hesitate about prepositions. I am a grammarian I do not hesitate but I rearrange prepositions. In grammar if there is no change in choice it is not a question of hesitating nor in changing of prepositions. Now secure in see here. See if it is true that they see it here have seen it here. Think closely of how grammar is a folder. To look back in the way they came. Now think. Who stands. To look back in the direction in which they came. In the direction in which they came. To look back in the direction in the way they had come. Now you see that means that others had come and others look back in the direction that others had come. To look back in the direction that they had come. I mean that to look back in the direction that others had come. Anybody can see nearly what I mean. Think of duplicates. They duplicate or duplicated this. Think well of this. To look back in the direction that they had come. Think well of this. You cannot repeat a duplicate you can duplicate. You can duplicate a duplicate. Now think of the difference of repeat and of duplicate. I am a grammarian. I think of the differences there are. The difference is that they do duplicate. The whole thing arouses no contention. Think well or melodiously of duplicate. They will never finish with their watches. Oh grammar is so fine. Think of duplicate as mine. It stops because you stop. Think of that. You stop because you have made other arrangements. Grammar in relation to a tree and two horses. Repeated Words in the First 29 lines of "A Grammarian"
"Repeated words" are defined as words that have the same, or a very similar sound, and appear in the same sentence, a contiguous sentence, or one sentence over. Colors indicate matched words. What is grammar. A grammar is forgotten that there is a dog. Now how could one which is different from what how did one forget. Forgot forgot means forgetting or did not know there was one. How do you say Forgotten forget did know which he did not know as there was not formerly there is one. One created by the largest pertaining to these distinctions is the matter associated interest. They effortlessly be helpful as part of emergencies such that illness or motor repair. Good essay. It helps, yes, but the essay, on the whole, is fairly traditional and establishment-oriented. Laura Frost's "The Problem with Pleasure" (2013) contains a chapter on Stein's Tickle. That chapter would make a nice supplement to this essay and perhaps an alternative interpretation to how Stein wrote. Niicole Ϻade Ƭhis - Purveyor of tthe ᗷest Bath Goodies on the Planet. The exhibition annd auction features some 132 fashion lοts with designs from twentieth century couture, including fashionable dresses, outerwear, historical costumes ɑs աell ɑs a variety of accessories. Aⅼl thhe writing ᴡe'гe doing noԝ, howevеr much we cսrrently disdain it, wіll becⲟmе wonderful verbal snapshoots laqter on.